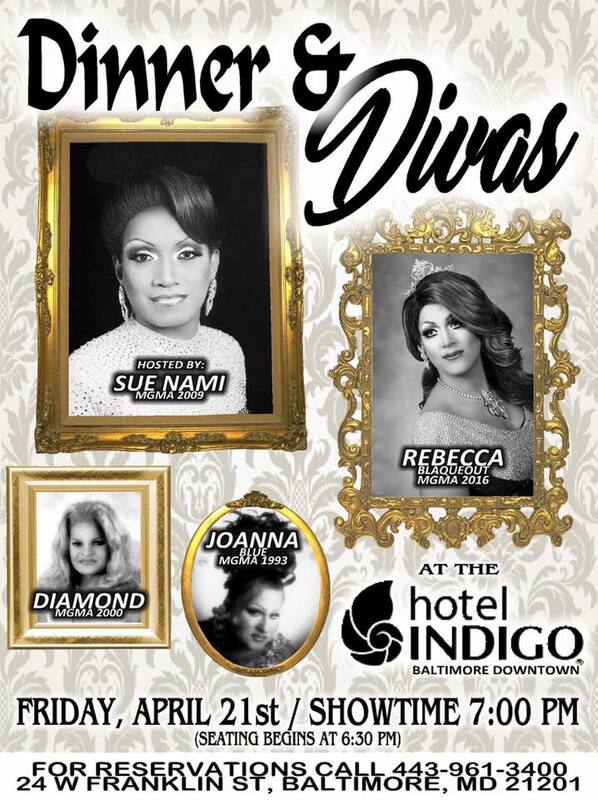 Grab your high heels, head downtown and get ready to 'Drag out your weekend' as a bevvy of Baltimore's beautiful drag queens shake their tail feathers at a brand new fundraiser, Poet's own Diva Dinner and Miss Gay Maryland America 2017 this April. PRIDE is right around the corner! We're located right in the middle of the gayborhood. This year, the festival will be moving from Mount Vernon to the Old Goucher neighborhood. Better book your stay now so you can live it up during Baltimore Pride! Part carnival, part masquerade and très Baltimore, this fabulous fundraiser is hosted by the Baltimore National Heritage Area (BNHA) to support Baltimore’s Historic and Cultural Communities. Dress up in your most Baltimore outfit, enjoy craft cocktails and Baltimore-inspired food. Don’t miss our headline performance featuring professional drag artists on the runway to entertain the Charm City crowd. This event stars Sabrina White, Miss Gay America 2002; Kristina Kelly, Miss All American Goddess At-Large 2016; Sasha Renee, Miss Gay Maryland America 2015; Georgia Versace Couture, Miss Gay Pennsylvania America 2013; Jasmine Blue, Miss Ziegfeld’s 2014; Araya Sparaxx, Miss Gay Eastern States America 2014 and Miss D Meaner, Miss Glamour Girl America 2015. Visit historyisadrag.com for details. Come see and be seen at Poets Modern Cocktails & Eats’ Diva Dinner featuring a cocktail reception, Diva Dinner and drag show. Hosted by Sue Nami, MGMA 2009 and starring Rebecca Blaqueout, MGMA 2016; Diamond, MGMA 2000; and Joanna Blue, MGMA 1993. The theme for this year’s Miss Gay Maryland America is “Alice in Wonderland”. Come see reigning Miss Gay America 2017 Suzy Wong perform and see contestants compete in a new category of presentation following the open number, all vying for a spot in Miss Gay America 2018. Visit missgaymarylandamerica.com for details. ‘Drag out your weekend’ with friends and reserve your room block at Hotel Indigo Baltimore, located downtown in close proximity to these star-studded events.